Pilot3D calls all line, polyline, and curve entities “curves”. The reason for this is that they are all variations of the same thing – a series of connected edit points with additional information about whether the edit points are at a hard (knuckle) point or at a smooth point on the curved line. This means that one “curve” entity can contain both curved and polyline sections. This is one combo “curve” entity that contains both a curved and a polyline section. This is a powerful idea. Most CAD and graphics programs force you to have curves and polylines as separate entities. That makes life difficult if you have contours made up of a mix of these two types of entities. It’s more difficult to join, break, and change the shape. With Pilot3D, you can start with either a polyline or a curve and change each edit point back and forth between either a smooth curve point and a hard polyline point. This is done with the Curve-Knuckle Point command. Start by creating a plain polyline or curve entity. This is a polyline with seven edit points. There are no curved sections. Select the Curve-Knuckle Point command and pick any of the (interior) edit points on the curve or polyline. You will see the point change from a hard or knuckle point to a smooth curve point. This command acts like a toggle switch – pick a point once and it switches to the other shape. Pick it again and it switches back. This is the same entity after the middle point was converted from a hard or knuckle point to a smooth or curved point. The Knuckle Point command switches any point back and forth between a knuckle and curved shape. This is the same entity after two additional points were converted to curved points. The big advantage to this technique is that you can move any of the edit points and all of the pieces stay attached. You do not have to worry about breaking or joining the pieces. This shape was created using just the Move Point command. All of this means that a polyline and curve are just variations of the same kind of entity. With the “Knuckle” command, you can change a curve to or from a polyline or curve – or define a mix of curve and polyline sections. One entity can be used to define an entire contour of straight and curved sections. You don’t have to bother with joining and breaking entities. It is very easy to create complex curved shapes. 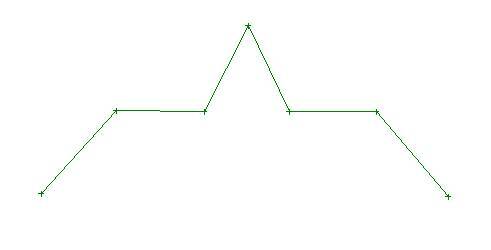 You change the shape of the combo-curve just like the other curves and polylines. Select the Edit-Move Point command and start dragging the edit points. You can right-click on an edit point to set the [X,Y,Z] coordinate values. You delete a combination curve in the same way as for polylines and curves, by using the Curve-Delete Curve command.